With Halloween fast approaching, we are getting party ready with our long list of Halloween party games to keep the Spooky and festive party going! 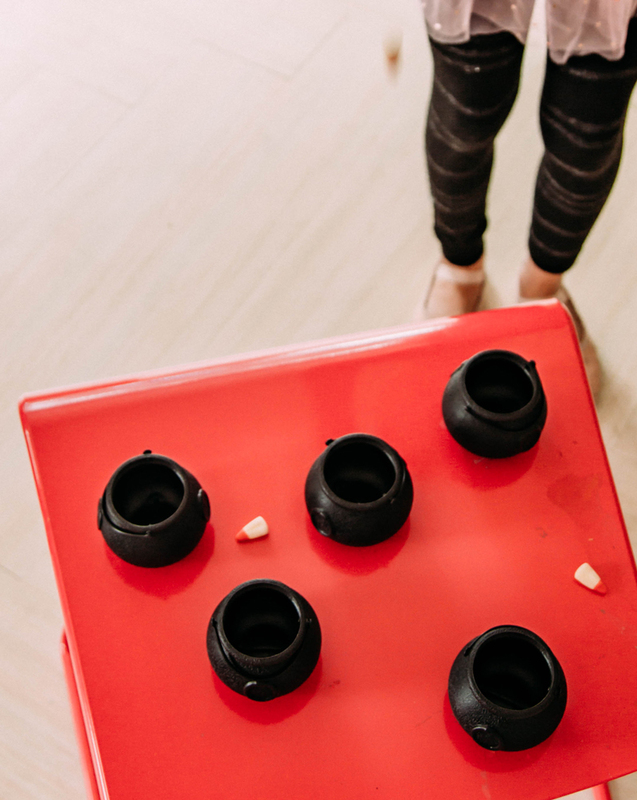 Our party games make a HUGE difference in how much fun everyone has at our gatherings and who in their right mind wouldn’t be willing to play Halloween games while already dressed up for fun! It seems like every year Halloween sneaks up on us as we all go into panic mode trying to nail down the perfect outfit and plan the perfect Halloween party at the last minute. Anyone else, or is it just me? HA! In all honesty, I really love Halloween and all the fun that comes along with it. 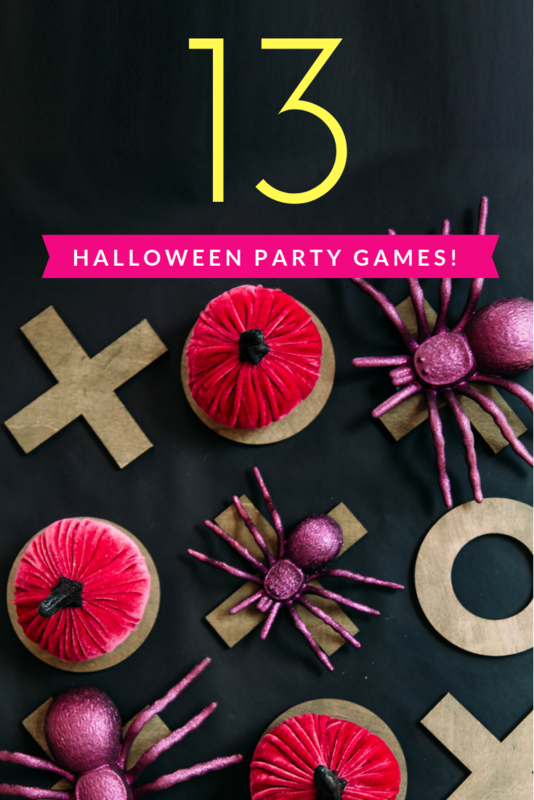 And this year, I’ve got the whole planning the Halloween party thing done for you with this list of 13 Halloween party games that are sure to bring something spook-tacular for everyone playing! Every Halloween party seems to have loads of kids running around, it’s like they somehow multiply this time of year. Keep them occupied and having fun with these super simple to set up Halloween party games just for kids! Break open the broom closet and bust out the broomsticks for this witchin’ hockey spin-off! Split up into two teams and make sure each player has their own “broomstick.” I’d recommend using the old school straw/corn whisk variety rather than say a push broom, mostly because they more closely resemble a witch’s broom, but also because the push broomer would be at a way greater advantage ;) Using a pumpkin as the puck, see who can score the most goals by using their brooms to roll the pumpkin into the nets. Store-bought or homemade, this Pumpkin Piñata game is the perfect way to pass out treats to the whole party! Either pick up a pumpkin-shaped piñata at the store or make up one of your own by scooping out the seeds from a large pumpkin and filling up with candy. This one is a Halloween craft + a Halloween party game. Decorate empty tissue boxes with green and black construction paper to make them look like mini Frankensteins. Then, fill them up with a variety of slick & slimy, ooey and gooey things like cooked spaghetti noodles, cubed jello, or mashed banana. Have players reach their hands in the Frankenstein heads and guess what makes up their brains! Danger, Beware! This Graveyard Dig Halloween game is perfect for a backyard sandbox. Bury some skeletons (fake of course!) in the sand and let the kids see how many bones they can dig up. You could also DIY a sandbox with a big storage bin to bring the fun indoors in case it’s too chilly to be outside. With all those kids running around, we don’t want to forget about the adults in the room. Here’s a list of Halloween party games for adults that will have everyone in a festive mood in no time. 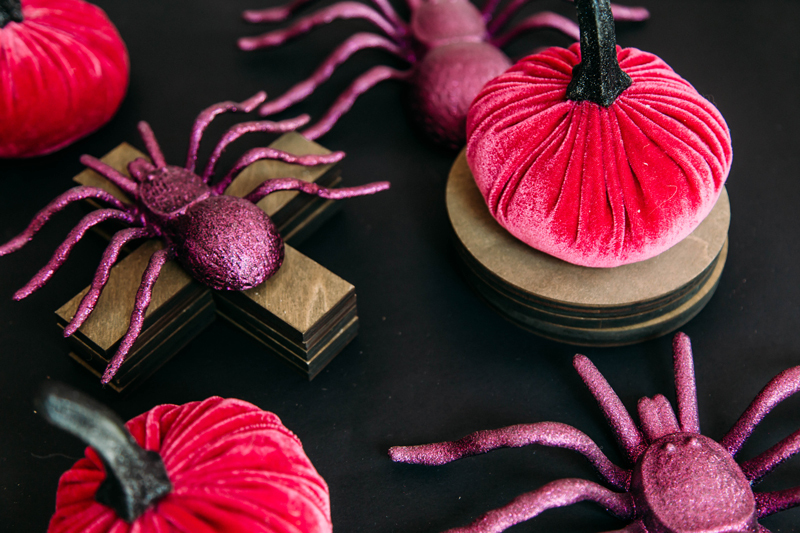 Change out the X’s and O’s for spiders and pumpkins for a spooky round of tic-tac-toe. This game is perfect for little goblins and ghouls because it’s simple and fun! Speaking of TP. Oh wait… were we not speaking of that? Now is the time! This is one of my all time favorite of the Halloween party games. Split into teams and see who can use it to wrap up players into mummies the fastest. When the players are mummified, the only part of their bodies that should be showing are their eyes! This game tests speed and skill…it’s a double whammy. Bingo gets a monstrous makeover in this Monster Match game. 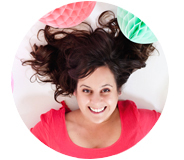 See who can get 4 monsters in a row and click here for a free printable! One thing is for sure, the more the merrier with these fun Halloween games. I’ve never seen a massive party game that didn’t leave with everyone in smiles, no matter what time of year it is. Little plastic spiders are easy to come by this time of year; just check your local dollar store or the party aisle. I highly recommend the sparkly kind…you can get the full how-to for a DIY bunch of your own right here + a Halloween cocktail recipe, YUM! The only other thing you need for this game is some straws. To play, have two people stand at the same end of a table and see who can blow their spider to the other end the fastest! Boo! You’re it! Ghost tag is the Halloween version of flag football tag. Everyone’s going to wear a freaky festive belt and the aim is to tag your opponents by pulling off all of the ghost flags when they’ve got the ball. Blow up some black latex balloons and decorate them with white paint markers to look like black cats. Think eyes, ears, and whiskers! Scatter them on the ground and see who can stomp and pop the most black cat balloons in one minute. It would also be fun to fill the balloons with little prizes, like a piece of candy or stickers for a spooky surprise with each POP! Although any of these above games cane really be recreated in a classroom setting. Here are 2 simple Halloween party games that we LOVE to play in Halloween class parties with the kids. Candy corn is one of my favorite Halloween candies of all time. They’re buttery and sweet and perfectly tiny, making them great for tossing into snack mixes, cookies, and in this case, jack-o-lanterns. To play Candy Corn Toss, throw the candies into the jack-o-lanterns one by one, to see how many you can get to land inside. And P.S., the real fun is in gobbling them up after the game’s over! Did you know toilet paper rolls make perfect pins when decorated to look like little ghosts? And that all it takes to convert a pumpkin into a bowling ball is 3 tiny holes? Well, now you do! A great last-minute option, a game of Halloween bowling comes together quicker than a batch of witch’s brew! Have you ever played an unforgettable Halloween party game? Hopefully at least one of these will become your new favorite! Have a freaky fun time trying them out and let me know in the comments which ones your party guests liked most. You shared such nice blog. Thanks for sharing this post.